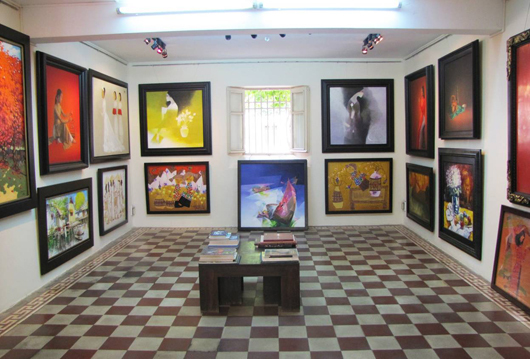 Vietnamartist.com is a combined online gallery for two leading art galleries in Ho Chi Minh City, Vietnam. The website started in 1999 and has successfully provided thousands of paintings to collectors around the world. The founder of the website and owner of both galleries, Ms. Tran Thi Anh Vu has been a leader in the Vietnamese Art community for over a decade. Through our serious and impressive presence in Saigon, Vietnamartist.com is able to offer the highest quality paintings from the most famous artists in Vietnam: Nguyen Thanh Binh, Bui Huu Hung, Ho Huu Thu, Do Duy Tuan .. to name a few. Because we are strong both on-line and locally, we are able to provide the best service to our clients both in Vietnam and abroad. Our staff is well prepared to offer consulting to those who are building their collections of Asian Art. We are able to connect serious collectors with artists to commission the paintings, we are also able to search for specific scenes, topics and color combinations. Our goal is to help our clients to find the right work of art for their collection. Email us at: info@vietnamartist.com.